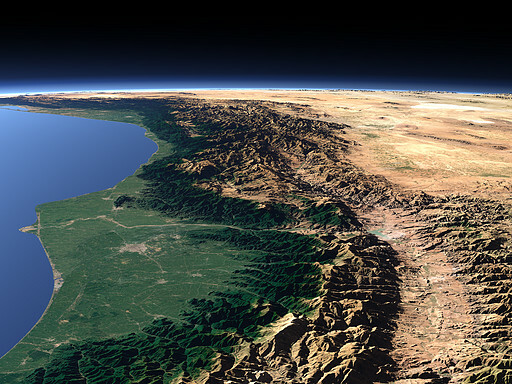 The Alborz Mountain range separates the Iranian plateau from the Caspian Sea. In contrast to the dry plateau the north side of the mountains and the coastal plains are humid and green. 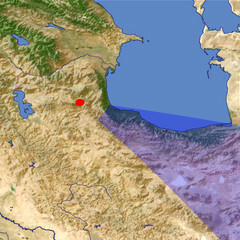 In the foreground the Sefid River crosses through the mountains and enters into the Caspian Sea near the city of Rasht. hello! tnx a lot!I am from Guilan.from Astaneh Ashrafiyeh!I can see my city in this picture.Astaneh Ashrafiyeh is in the near of the SEFID-ROUD(WITHE RIVER). It is very nice!That is first time that i see Guilan from space.tnx. can you show us a pictuer of nalchik city , it's beside albroz mount , plz ? why this picture is mirrored? It is very beautiful and fantastic view of Alborz mountain range in northern Iran and Mount Damavand. It's so beatuful and usefull pix, it was used for my thesis. Very nice views of Alborz mountains! My cousins grand dad lives in Gilavand at the foot of Mount Damavand. He is a lucky man to experience all this beauty from grounds up!! very grat pictures from strong mountain,in this picture the green are,montains and desert are next to each other and one of the wonderful scenes in the world is created. Fantastic view of Rasht and Alborz! Fantastic view of Rash and Gilan! Very Very Nice & Beautiful. Thank You! Great! so beautifull , so incomparable and so wonderful. Thank you very much. So proud of being Iranian, Thank you for the impressive image of alborz and ever-green Province of Gilan . I am glad that such nice images are now possible to be introdued to all about Iran [although it may also mean that the big brother(s) is (are) watching us!!!]. Love your land, wherever you are! Just amazing and very nice ! Thankful if you load more like this above Iran. showing 5 of 21 comments. Show all.